Food Review: The Second Location of Maya Mexican Grill Brings Outstanding Fare Downtown | Food and Drink | Style Weekly - Richmond, VA local news, arts, and events. 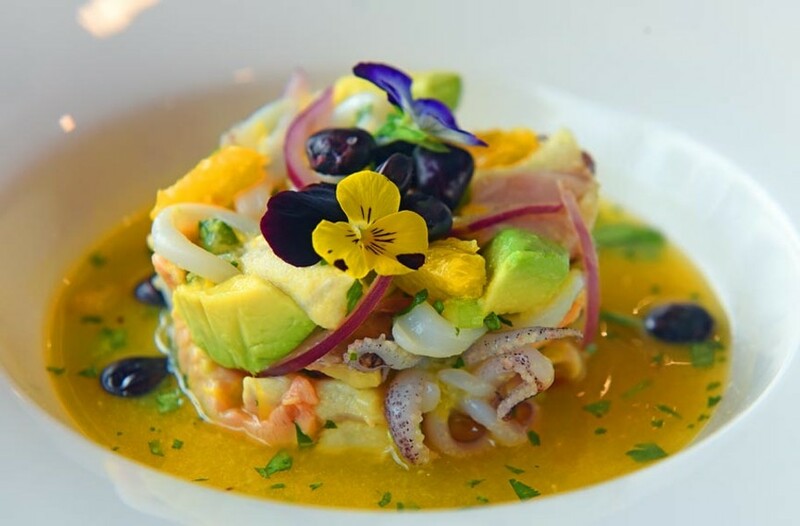 Scott Elmquist Maya Mexican offers a daily ceviche special — here, octopus, scallops, shrimp and avocado are topped with red onions, oranges and edible flowers for a burst of color. Maya Mexican Grill and Tequila Lounge has made a name for itself in the far West End for its refined and creative take on Mexican cuisine since 2013, filling an obvious niche in the restaurant scene. Owners Maria and Michael Oseguera expanded their holdings a year ago and leased the Berry-Burke building, conveniently opposite the Dominion Art Center on the burgeoning restaurant row of East Grace Street. It initially opened as Lucca Enoteca Pizzeria and specialized in coal-fired pizzas, but the couple re-branded the spot in the fall and brought the popular Short Pump restaurant concept downtown. With high ceilings, wood floors and massive glass windows, the space is expansive, while the artful decor keeps it from feeling cavernous and impersonal. A bar tucked into the corner, away from the main dining room, offers a cozy space to try the happy-hour food and drink specials. Excellent, freshly made margaritas wash down appetizers such as queso fundido ($11.95/$5 happy hour), a skillet of a melted mélange of cheese studded with chorizo and black beans accompanied by a basket of tortilla chips. It’s a hearty dish best shared to avoid ruining your appetite for the excellent entrees to come. Try the plate of crispy chicken flautas ($10.95/$5 happy hour) — small deep-fried tortillas rolled around shredded chicken — to hit all of the salty and crispy notes that you crave when drinking. While so many Mexican and Tex-Mex places in town specialize in heavy, sauce-drenched enchiladas or overstuffed burritos, Maya focuses on fresh, seasonal ingredients, as well as options that go well beyond what’s familiar. Ceviche ($19.95) is the perfect example. The restaurant offers a daily special that highlights what’s available, and on one visit, I find it composed of octopus, salmon and scallops served in a bright citrus marinade, punctuated by oranges, onions and avocados. It’s the epitome of freshness. Other seafood options are worth trying too, especially the exquisite sweet corn tamale with shrimp and scallops ($25.95). The tamale is the centerpiece of a beautiful plate, and arrives flanked by tender scallops and shrimp. The accompanying tomatillo and red-pepper cream sauces bring the right balance of sweet and savory notes to the dish, with just a hint of heat. More widely available Mexican fare is elevated at Maya, with tacos featuring duck confit or tamarind shrimp. The chipotle bourbon tacos ($17.95) feature skirt steak with a sweet glaze, while one of the most traditional dishes in the Mexican repertoire, tacos de carne asada ($15.95), might be one of the best in town, with meltingly tender and perfectly seasoned steak. If your meal doesn’t come with the black beans, do yourself a favor and order a pot on the side. Cooked until creamy and topped with mild cheese, the beans complete most any meal. At Maya, you can play it safe with tacos or enchiladas — try the mole poblano sauce ($17.95) — or taste Mexican-influenced versions of classic American dishes, such as the mango molasses ribs served with a jicama slaw ($19.95). Whatever you try, the food on each of my visits is consistently excellent. The service, however, is uneven. Online customer reviews for anything have the potential to be misleading, sometimes attracting more folks with negative experiences than positive. In Maya’s case, dissatisfied online customers appear to think that the food is great, but that the service needs work. During the course of my three visits, I come to agree. Unfailingly friendly, the staff is clearly enthusiastic about the food. But the speed of service varies tremendously. On one busy night, everything comes out at a reasonable pace. On a slow night, we oddly wait a long time. Most problematic, though, is a server’s response to an allergy alert from my dining companion. Though she promises to tell the kitchen, the directions aren’t followed. When we make note, the server shrugs it off. My companion must leave early to address the allergic reaction, but nothing is said or done to acknowledge the issue.